Here are the SEO trends you need to stay on top of in 2017. 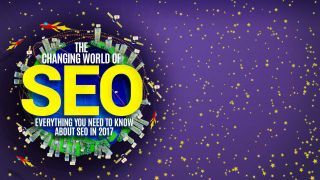 2016 was a seismic year for the world of SEO. Google dramatically altered the rules – so much so that a website built with great SEO 12 months ago could well have fallen foul, and dropped in the rankings. Changing the way SEO works is nothing new in the fight against 'dirty SEO', but even by Google's standards, the changes the world's biggest search engine made in 2016 have really altered the SEO landscape. As web designers and developers, if you're not fully up to date, you risk a backlash from customers and your reputation as cutting-edge could well be gone forever. SEO hasn't been a fashionable topic for years, but it's essential you understand the latest trends to stay ahead of your rivals. So what exactly changed last year? Perhaps the most important was the switch to mobile-first indexing, while there was a big push for HTTPS and SSL-based websites, as well as greater AMP usage and adoption. There was also a crackdown on pesky pop-up ads, and Google's search algorithm began to have a greater understanding of content. It might not seem like much on the surface, but it has significantly altered the game for designers and developers. Here we look at these changes in depth and how they will alter the way you work. We've talked to some of the biggest names in the industry to give you the ultimate rundown of everything you need to know about mastering SEO in 2017. Let's start with the most important aspect of SEO in 2017. The way users search Google has been changing for years, and searches made from mobile devices, such as smartphones and tablets, have finally overtaken the traditional desktop methods. Google recognised that in November 2016 by introducing mobile-first indexing into its search criteria. Your SEO strategy should shift to mobile straight away – it's no longer an option to be mobile friendly, it's an absolute essential. Mobile is a trend that is only going to get bigger, and its importance to your online presence cannot be understated. Paul Tyler, head of SEO at All Response Media, believes the new mobile-first indexing will ensure that mobile is the primary focus going forward. "As the number and percentage of searches on mobile has surpassed desktop in many verticals, not approaching SEO from a mobile-first mindset has become too big of a business risk, " he says. Simply having a responsive website won't be enough. An understanding of what makes a great mobile experience is equally important, as Tyler explains: "Whilst many organisations have a mobile friendly website, they still don't understand the role that each type of device plays in the purchase journey as yet, which is critical to maximising both UX and site conversions." If your site isn't optimised properly for mobile, users won't go back to it. It's time to take building for mobile very seriously. Social media should form a major part of your SEO strategy. In fact, it probably does now without you knowing it. Your business is present in many more places than just a single website. You'll have a Facebook page, a Twitter account, Instagram profile, YouTube page – the list goes on. The next time you search on Google, spend a bit of time having a look at the number of social media accounts on the first page of results. While Google hasn't officially made the correlation between social media and SEO – the reality is obvious. Building your brand in this way is known as 'off-page' SEO. 'On-page' SEO is the technical SEO that underpins your site (metadata, load times, CSS etc), while off-page is the stuff that happens outside your site. External elements like social media likes, shares and follows help to raise the ranking of your webpages in Google searches. Natural off-page SEO helps tell Google what users think about your site. Building a brand will have a positive effect on your SEO results, helping to increase traffic and make your business easier to find online. Google is placing much more emphasis on the speed of your website this year. Although that's always been a big selling point to users, Google is now purposely looking more and more at the holistic SEO experience, and speed is playing a huge role in page rankings. Some of the technical changes being championed in this feature could have an adverse effect on website performance, so it's absolutely essential that you make sure your site functions at 100% after making those changes. Limiting errors like redirects, 404 pages and orphaned pages will not only help performance, but it will give you a huge SEO boost. Implementing HTTPS/2 will have a positive impact on website optimisation. Daniel Stenberg notes that the amount of data now required to load the home page of an average website is 1.9MB, with over 100 individual resources required to display a page. HTTP/1 hasn't been updated since 1999. It's fair to say that websites are built differently in 2017. Jump onboard with HTTP/2 (it is backwards compatible) as soon as possible. "Site speed is being pushed hard by Google ," says Tyler. "It will be an even bigger focus as HTTP/2 implementation increases over the next few years." You've been told. One of 2016's biggest trends was the increase in searches made by voice. Apple's Siri, Amazon's Alexa and Google's Echo have fundamentally changed the way users search with their mobile device. It's a market that has seen tremendous growth, and that won't change anytime soon, so SEO experts need to bear it in mind. To understand how important voice search is to SEO, some commentators believe that by 2020, 50% of searches will be made by voice. Users definitely search differently with their voice, using longer sentences and more natural language. It's easy to imagine searches becoming requests for immediate action, and this will impact on your keyword research and site mapping techniques. Neil Patel, co-founder of Crazy Egg, says: "The good thing is that voice search optimisation is fairly straightforward and intuitive. I find it to be much less robotic than the more antiquated SEO techniques. By getting on board right now and making it as easy as possible for digital assistants to understand your content, you'll be in a position to thrive for the foreseeable future." You can find out more on optimising for voice search here. Backlinking – those links directed to your website and used by search engines as an indication of popularity and importance – isn't anything new in the world of SEO, but it remains a great way to boost your SEO ranking. We won't go into detail about the various back-linking techniques available (because there are dozens), but its importance can't be understated, even if it's become an unpopular method in your SEO arsenal. "What's really disturbing," says Moz's Cyrus Shepard, "is some people are giving up completely on link building when it's still a really huge part of Google's algorithm." Need more encouragement from Shepard? See here. "When you're doing link building right, you don't even need the links because you're doing good marketing, " he continues. "You're pushing your content out there, you're talking to those influencers, you're getting traffic to your site, and those just happen to be the signals that Google wants to reward." Users are becoming more and more demanding. The days of stuffing sites with a barrage of keywords has long gone. Those pages were easy for a search engine to crawl through but the user experience was generally appalling. Google is clever enough to sift through a wall of keywords, demote those pages and instead promote what it believes is great content. It's easy to see how the role of a good copywriter has become essential to web agencies. They agree – content is king. You wouldn't buy this magazine just because it looks good. The words on each page are equally as important to the readers. As Tyler argues: "Even a site with a great technical foundation that loads extremely quickly will not drive business performance if your content doesn't address the right audience or the right questions that need to be answered." Great content builds a community, creating a subtle link between what you say and what your audience is searching for. On the other hand, don't think that updating frequently is enough. Users are on the lookout for authentic content, and they want articles to be well researched and be packed with multimedia content. That content should always be shareable to your social media channels, helping to attract and retain visitors. As machine learning makes Google's algorithm more advanced, UX is pivotal to the future of SEO. These advances have enabled the search engine to focus on providing the most relevant results, in not only content but user experience as well. "Users are becoming more demanding and just having good content is not enough anymore," explains Tyler. "Content needs to be fast to load, feature excellent design on all devices, utilise the right format, match user intent and, of course, have great UX." If UX isn't part of your SEO strategy right now, you desperately need to broaden your horizons or you will lose pace with your forward-thinking counterparts. Convention may tell you that SEO and UX are completely different parts of web design, but you'd be a fool to ignore this perfect marriage. In his article UX vs SEO: Web Design Battle Royale, Zach Rutherford argues that good SEO mixes well with good UX. "They have way more qualities in common than one might assume, " he explains. "Concise, legible, and informative copy – sprinkled lightly with high-quality keywords – serves the purposes of both UX and SEO. Not only that, but properly structured sites are intuitive for search spiders and users alike." As an entertainment medium, video is hard to match. Just look at Facebook's evolution from a simple photo-sharing hub to a feed full of video, or the rise of YouTube and more recently Snapchat and Instagram Stories. Some of the most impressive new websites are built with videos scattered into the design – what better way to introduce your brand than with a homepage video? Video has wide-ranging consequences for eCommerce sites in particular, providing a better way to show how a product operates, how best to use or store it, and how it looks in regards to quality or size. Visitors to your site are more likely to buy a product or understand a topic through approachable step-by-step videos and tutorials. These videos don't necessarily have to be of the highest quality, but they are definitely worth doing because they offer a great way to become an authoritative voice, build a trusting relationship with your audience and also increase your site's conversion rates. Technical SEO is also going through a development renaissance at the moment after being considered less important for the last few years. It ensures that your website architecture is compatible with essential search engine guidelines, and can be indexed and ranked for keyword searches accordingly. This includes optimising for speed, but more recently Google's new Accelerated Mobile Pages (AMP) project. It might offer limited functionality at the moment, but the positives (prominent real estate in Google's mobile carousel, increased traffic, higher click through rates, etc) far outweigh them. As Tyler pointed out earlier, technical SEO should be the foundation of your SEO but it's only part of the strategy. Want to keep up to date with the world SEO? Follow Google! We've highlighted Google very heavily in this feature, but there is good reason for that. While Bing might be registering good numbers thanks to the popularity of Windows 10 devices, and DuckDuckGo has become the search engine for the security conscious among us, Google is still firmly number one in the market, and that isn't going to change anytime soon. So if you want to stay ahead of the SEO game, Google is the search engine that you need to base your development around. But that can actually be quite tough, because Google is constantly changing the SEO goalposts and creating an SEO landscape that is almost always in a state of flux. To give you an example, Google changes its search algorithm approximately 500 times a year. You need to know when these changes are implemented and explicitly how they affect individual pages on your website. SEO tactics you employed two or three years ago might not work in 2017, and that can have wide-reaching implications for the business if you don't invest time and effort into reevaluating your SEO strategy. What's the best way to stay number one on Google? Analyse your performance to get a greater insight on how you perform so that you can implement change with authority. As Tyler argues: "Ongoing testing is key to learning what works for your site, your audience and your SEO strategy, as these will all change over time and if you are not learning and evolving, your competitors probably are." The world of SEO is changing fast – make sure you're not left behind.